By Benson Chinedu Olugbuo, Ph.D. The CLEEN Foundation, a non-governmental organization with a focus on building trust between the police and the people in Nigeria through improved police accountability, was among the first recipients of the MacArthur Award for Creative and Effective Institutions. The Award, launched in 2006, provided institutional support grants to recognize exceptional Foundation grantees and help ensure their sustainability into the future. The absence of a sense of accountability to the people has been the missing link between the police and the people they serve in Nigeria. 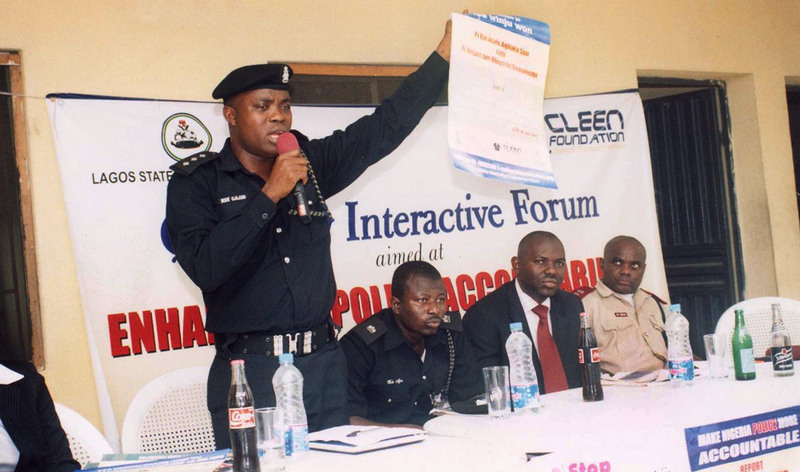 For two decades, the CLEEN Foundation has worked to transform the culture of policing in Nigeria, which had grown corrupt and abusive under several years of military dictatorship. This loss of confidence, poor relationships, and hostility, sometimes led to outright violence between the people and the police. To contribute to changing the status quo, CLEEN designed its Police Accountability Program, which aimed to build public trust in the police. Projects pioneered under the program included police-community partnership and accountability forums to create a meaningful dialogue as well as enable feedback on public complaints about the police. These efforts contributed to changing citizens’ mindsets about the police, moving from the hostility that characterized the military era to improved relations that strengthened internal and external mechanisms to hold police officers accountable. Since 2002, more than 5000 police officers have been dismissed for misconduct following public complaints and hundreds have been demoted. We work within the system, rather than agitating from the outside. That’s how we mobilized Nigeria’s national police leadership to revive the Police Public Complaint Bureaus, which are based at the nation’s 36 police command centers and help monitor police conduct and make it easier for the public to protest incidences of abuse. Since 2002, more than 5000 police officers have been dismissed for misconduct following public complaints and hundreds have been demoted. As a member of Altus, an international network of criminal justice reform organizations, we organized police station visits by residents in Nigeria and five other African nations. Following the visits, the police stations were scored on issues including community orientation and physical and detention conditions. Through MacArthur’s support for these projects and institutional strengthening, we built a resource for learning and sharing on issues of public safety, security, and justice locally, regionally, and internationally. This continues to make CLEEN a leader in this space today. Our successes reflect our theory of change, which argues that improvements in public safety, security, and the justice sector in general stand a better chance if activities are targeted at both the supply and demand sides of justice. We have a combination of expertise from both the demand and supply side, which allows for more robust engagements to bring about and influence desired change. This has made us valued partners by the demand side (civil society), trusted by the supply side (security agencies and their oversight agencies), and recognized by development partners. We have worked on strengthening the electoral process to help safeguard the successful transition from one civilian administration to the other. With an eye toward replicating models of our innovative programs in other countries, international agencies, and civil society organizations, we have mentored young people seeking a career in public safety and security as well as civil society organizations from Liberia, Sierra Leone, Gambia, and Ghana. This effort was later extended to Kenya, Uganda, and Congo DRC. The beneficiaries are today leading programs and organizations across Africa and often cite their experience in CLEEN as pivotal in their career within the justice sector. Furthermore, with changing dynamics in the security situation in West Africa, including the rise of insurgency groups and entrants of non-state actors in security provisioning, CLEEN has broadened its focus beyond police and policing in Nigeria. Our work now includes accountability in formal and informal security organizations, election security, security sector reform, anti-corruption, countering violent extremism, and civil military relations, to mention a few. We have worked on strengthening the electoral process to help safeguard the successful transition from one civilian administration to the other. For example, we surveyed more than 22,000 respondents from several nations, the findings could help guide future election policies and procedures. All of these areas of work are pursued under our enduring mission of promoting public safety, security, and justice through empirical research, legislative advocacy, demonstration programs, and publications, in partnership with government, civil society, and the private sector. Between 2001 and 2017, MacArthur has awarded 12 grants totaling $4.78 million, including the $300,000 Award for Creative and Effective Institutions in 2006 to the CLEEN Foundation.